Firstly remember that zhalt is a misting apparatus that releases in the air via 3 nozzles, microscopic drops of insecticide from its tank. We have listed frequently asked questions about zhalt and provide easy but useful suggestions to obtain the most out of it. What are the products used together with zhalt? How much product does zhalt consume? What should I do in the event of an invasion of mosquitoes? 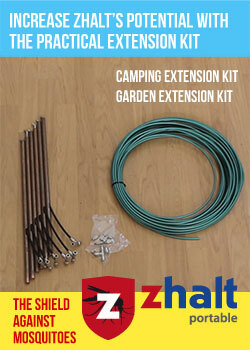 Zhalt has been tried and tested to be used exclusively with the product Tetrapiu Multipurpose and Naturiz. The product Tetrapiu Multipurpose is sold "ready for use " without the need to dilute it. You just have to tip it in the tank of zhalt. Whereas the product naturiz is a "is a concentrated liquid" that needs to be diluted following our instructions for every 500ml (half a liter) = 7 liters of water. Meaning one liter bottle of product is enough for two recharges (zhalt’s tank can hold up to 8 liters). ALWAYS READ CAREFULLY THE INSTRUCTIONS ON THE LABLE BEFORE USE! HOW MUCH DOES ZHALT CONSUME? It consumes around 1 liter of product every 3 misting cycles. Zhalt uses 375ml of product for every cycle (3 minute misting cycle). It doesn’t matter which product in the tank, the consummation is the same. The concentrated product ‘Naturiz 1 liter bottle’ once diluted will result in 15 liters is advised to be used in a 2 misting cycles (morning and night) and consumes around 750ml a day. So enough for 20 days. . The product Tetrapiu Multipurpose is advised a 1 misting cycle a day and consumes around 375ml a day meaning that a 1 liter bottle is enough for around 2 weeks. 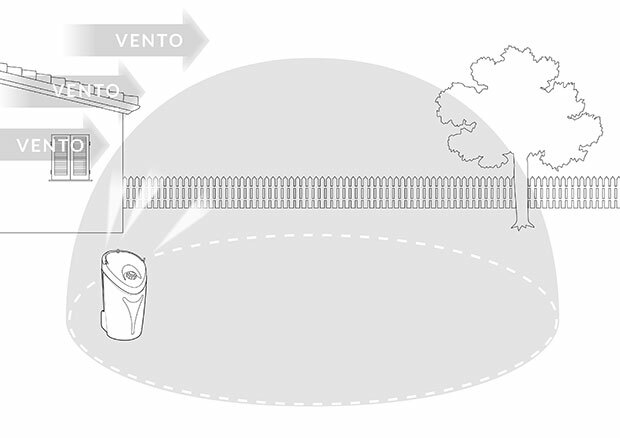 In case of strong winds position Zhalt in the same direction of the wind, as to not blow back on itself (*). 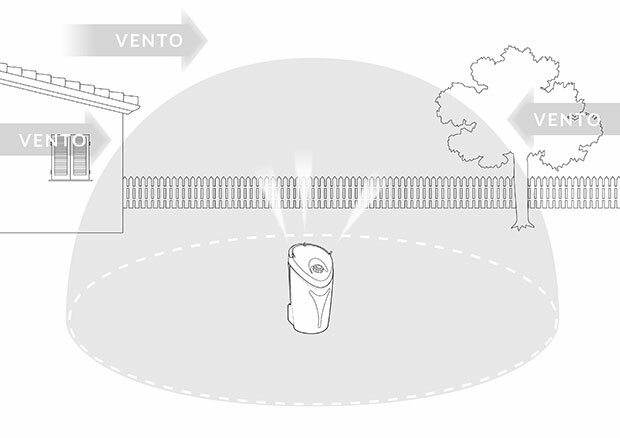 In case of winds in a combination of directions position Zhalt in the centre on the area to be treated (*). (*) If the mist droplets aren’t going in the direction required, stop the cycle by pushing the stop button and try a different position. In case of a complete absence of wind, we recommend that you position zhalt in a higher location so the mist covers a wider area. We remind you that zhalts’ mist is powerful enough to release the product in the air, but in the moment of no wind the mist droplets can remain nearer to the system, so please be careful not to place zhalt on any pavements made from terracotta or similar materials as it may leave marks. Avoid to keep zhalt under the hot sun, or avoid using at the hottest hours of the day. This will preserve the plastic parts on Zhalt and not overheat its electrical parts. In the packaging of zhalt we provide a free bottle of product Tetrapiu Multipurpose in which you can immediately start using your system. Tip the contents of the bottle into the tank following the instruction in the tips on usage. Remember, mosquitoes are usually active at sunrise and sunset. The first use we advise to set Zhalt on a 12 hour program (see tips paragraph 'Programming') also to do this around the hours of 19:00/19:30 which will repeat around 07:00/07:30. 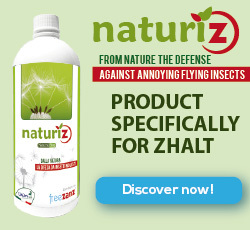 With only 3 treatments you will significantly see a reduction of mosquitoes. After these first few cycles using Tetrapiu Multi-purpose the tank will be empty, refill its tank with the solution of water and Naturiz following the instruction in the tips and activate the program at around 1900 by pushing the PULSE button. The product will slowly be released (1 hour and a half) in the morning and the evening. The combined action of using Tetrapiu Multipurpose and Naturiz together not only kills straight away and mosquitoes in the area, but also provides a bubble protection from further mosquitoes. Once the product naturiz has finished, we recommend repeating this procedure of 3 cycles of Tetrapiu Multipurpose and one of Naturiz. In particular cases you may need to repeat the cycle a little differently (2 cycles of Tetrapiu Multipurpose (one morning one evening PROGRAM 12 HR repeated 2-3 days) (1). In this case empty the remains of the product Naturiz found present in the tank following the instruction in the tips (closed container to avoid evaporation and keep in a cool dark place) and tip 1 liter of Tetrapiu Multipurpose into the tank. Programming a 3 cycle 12 hrs, for 3 days of treatment. Finish the product and re-put back into the tank the remainder of your mixture Naturiz. WE RECOMMEND NOT TO MIX THE TWO PRODUCTS TOGETHER. The given data is based upon the tests carried out by our technicians is a series of different trials in varied garden types, therefore being highly accurate. The best results of the product can differ from garden to garden depending on the individual situation. For this very reason we recommend trying the different products available to find one that best suits your needs. 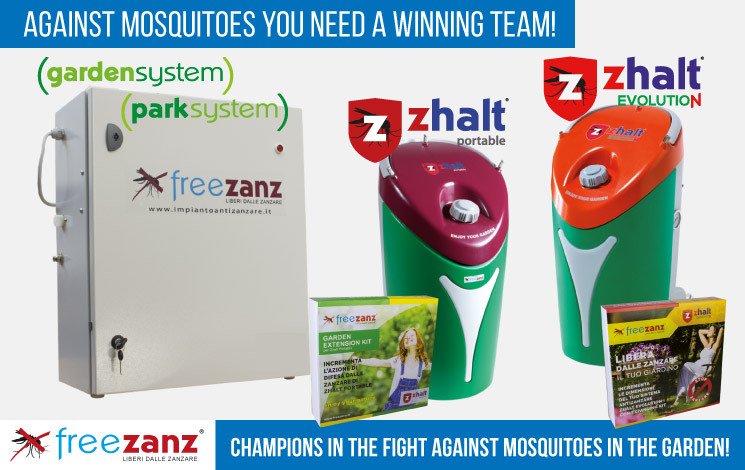 For best results we advise you start using Zhalt at the beginning of the summer period, when the number of mosquitoes in the area should be relatively low. This way with only a few treatments the insects should stay well clear of the area later on. Following this the program option 'Maintenance' with the product Naturiz will effectively keep the mosquitoes from returning.